KUNMING (Xinhua) – Every year, He Rujun celebrates at least nine traditional ethnic festivals with neighbours from seven different minorities. 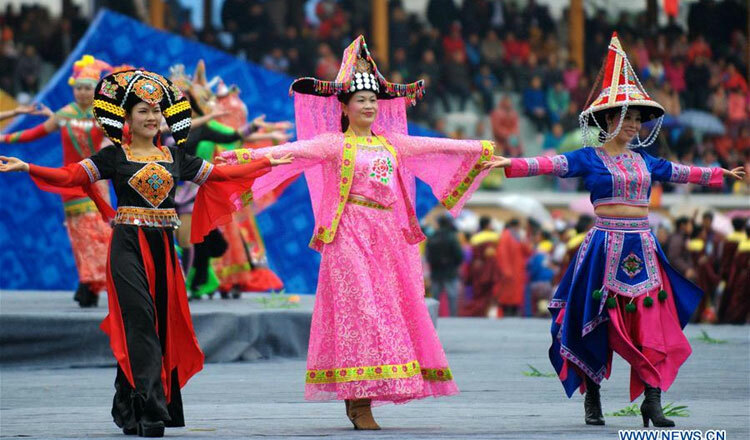 As one of the Naxi minority, Mr He wore a traditional costume of goatskin ornamented with seven round embroidered discs representing seven stars last Thursday to celebrate Sanduo Festival, one of the grandest annual religious events for the Naxi. “Almost everyone in my neighborhood joins the celebration, no matter which ethnic group they belong to,” Mr He said. He lives in the community of Beimen in the city of Lijiang, southwest China’s Yunnan Province, where more than 86 percent of its residents are ethnic minorities. Yunnan is home to 25 ethnic groups, including Dai, Bai, Hani, Yi and Miao. Different ethnic groups have their own language, costume and customs. To promote ethnic cultures, Beimen organises folk artists and culture inheritors to show their skills and give performances in popular tourist spots in Lijiang. Besides, it also holds grand celebrations on every ethnic festival and encourages residents to interact with each other so that everyone can have a better understanding of the diverse cultures and traditions in the community. “People can have a sense of ethnic pride and their cultural identity can be strengthened through communicating and celebrating together,” Mr Liu said. He Rujun has been living in Beimen for more than 30 years, witnessing the community’s tremendous change from a wasteland to a modern neighbourhood as the result of joint efforts by every ethnic group. “We worked together and hardened all the muddy roads. Last year, we renovated street lamps for about 11 kilometers and paved two new roads,” Mr He said. There’s an ethnic amalgamation in the community. He’s daughter married somebody from a Bai ethnic minority and his daughter-in-law is from the Pumi ethnic minority. Since the Naxi and Pumi people had been at war in the past, marriage between the two minorities once was not allowed, but Mr He’s family broke with the tradition. Conflict, however, is still inevitable. “Therefore, we set up a consulting committee consisting of representatives from all seven ethnic groups, seniors with a good reputation as well as leaders of our community, to solve disputes and clear up misunderstandings,” Mr He added. Such an open and inclusive living environment has also attracted foreign residents. So far there are 12 foreign households settling in Beimen, including those from France, Spain, New Zealand and the Republic of Korea. Ethnic solidarity also contributes to local economic development. “Thanks to the nearby Old Town, a world-famous tourist spot in Lijiang, residents in Beimen are engaging in the tourism industry, showing the world our unique diverse cultures,” Liu Linjun said. The annual per capita income of residents in Beimen increased to 38,000 yuan (5,562 US dollars) last year, up 12 percent compared with that in 2016. “All nationalities are from one family, and we have to guarantee all family members are living happily,” Mr Liu said.